Chewy deliciousness! Yum, this gnocchi recipe takes just minutes and it’s 5 ingredients or less! Boil the the gnocchi according to packaging instructions. In a separate sauce pan, heat the garlic and tomato sauce with a dash of salt and basil (to your preference). Heat for 5 minutes on low. 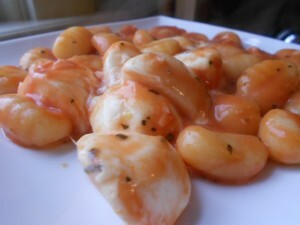 Strain the gnocchi, mix with the sauce, and stir in the cheese balls. You may want to chop the cheese into smaller portions. The hot pasta and sauce will heat and start to melt the cheese.